Most of the feedback was spot on. My header is too dark, though I like that it looks like my planner and don't have time to fix it right now anyway. Instead, I made my title and tag line brighter and easier to read. My side bar font colors were difficult to read, so I fixed that for you. I'm getting a better camera set-up for lighting my pictures. A lot of other feedback was excellent but time-consuming to implement, so I added the remaining tasks to my on-going blog plans in my planner. The bloggers who reviewed my blog are clearly good at what they do! Most of the feedback that I gave to others was focused on things that they didn't mention in my case, mostly because I've already addressed them. 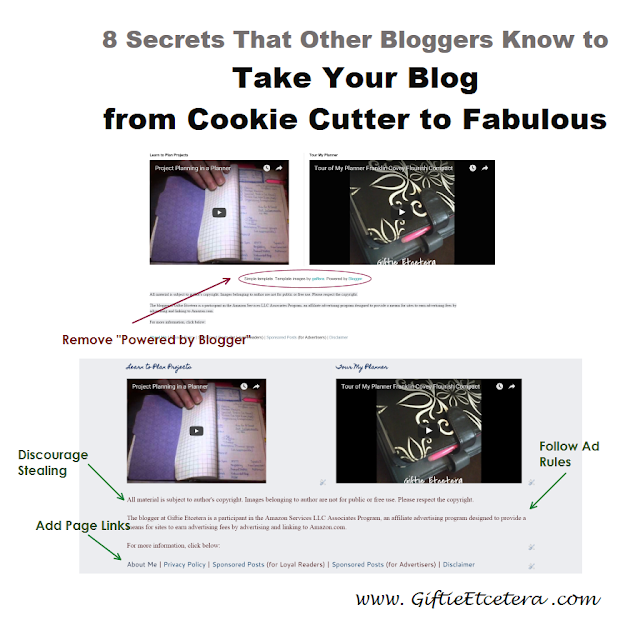 I wanted to share those secrets with all of my readers so you can improve your blog, too. Many of the steps listed below are designed to improve a blog by modifying a default, free template to look and be more professional and personal. But even on your paid template, these issues might be hanging around, unaddressed. Take a moment to note in your blog plan that you need to address them! 1. 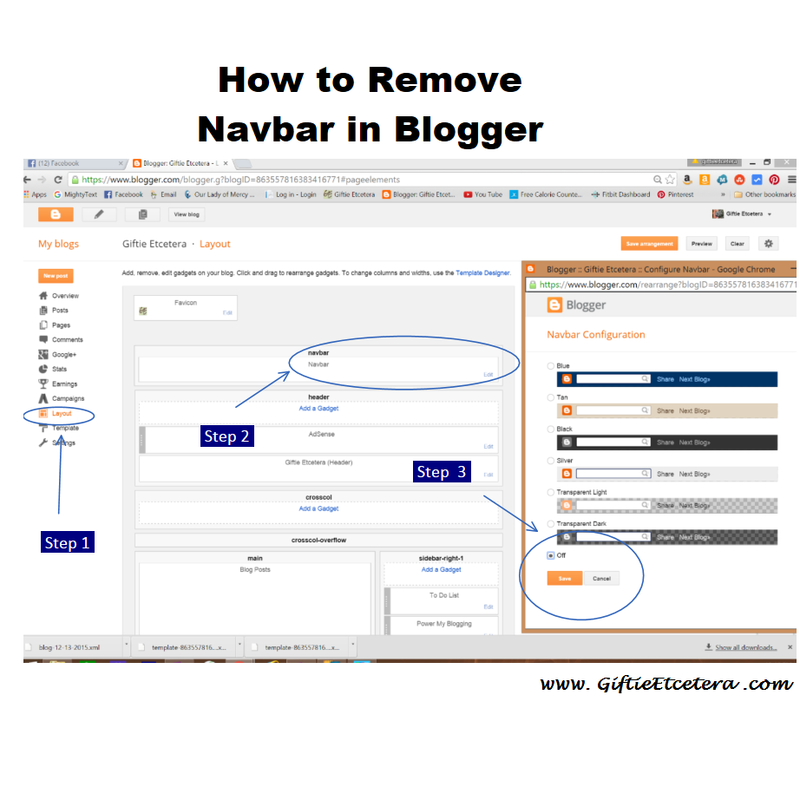 Remove the Blogger navbar, if you blog on Blogger. Then, go to "navbar" and click "Edit." Finally, choose "off" and click "Save." 2. Add a custom image to the header. As each template is slightly different, I won't walk you through adding a custom image. There are tons of blogs to Google that tell you how to add a custom image to either a Blogger or Wordpress template. TIP: Use a light-colored image that coordinates with the overall look of your blog and works as a background for the title, rather than a busy image like a picture of your family. 3. Change the title font. Choose a font for your title that is easy-to-read and reflective of your overall font scheme. One bit of feedback that I got over and over was to be more consistent with fonts. Normally, I agree with that advice. In my case, my side bar fonts are set-up to look more like a task list in a planner than just a blog. Hence, the artistic choice to ignore that otherwise great advice! 4. Keep your title short, but add a tagline. 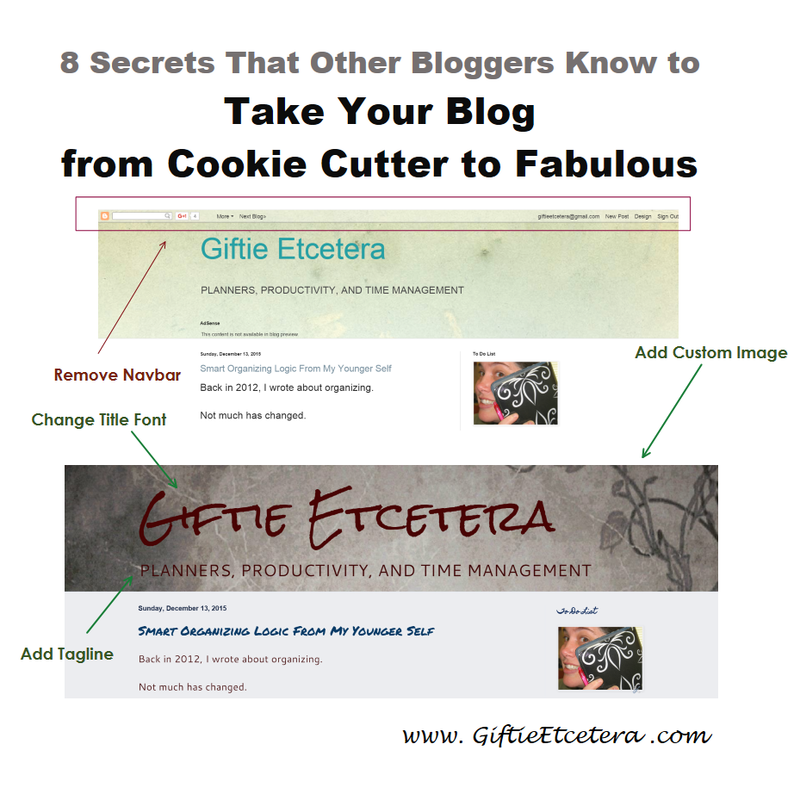 One blogger called my blog "misleading" because it is called "Giftie Etcetera." I struggled to take her seriously, mostly because her blog title was completely misleading and she called my planning and organizing tips "juvenile." The thing is that a blog name SHOULD reflect the blog, but at some point, rebranding is just not an option. I started out as Giftie Etcetera in my pre-planner blog days, but I grew a planner blog following. They refer to me as Giftie in planner groups. So I added a tagline: "Planners, Productivity, and Time Management." The short title is easy-to-remember, while the tagline keeps my blog from being deceiving to the reader. 5. Remove "powered by" and template credit from your blog. Again, Google can help you find the steps for your platform (whether Blogger or Wordpress), but it is doable. It is a little more complicated than removing the navbar, though. 6. Discourage stealing of content with a copyright notice. You own your own material anyway, on either of the popular blogging platforms. Might as well remind people of that, should they try to copy and paste your work as theirs. NOTE: I am a lawyer, but I am NOT YOUR LAWYER, so check with legal counsel for advice. This blog and its contents are not and should not be construed as legal advice. TIP: Proper blog etiquette is to tell someone about a great post with a short teaser and link directly to their blog, where people can then visit to access the content. I am an Amazon Affiliate and I note that on every page of my blogs, including the ones with affiliate links, both at the top of a linked post and with the EXACT WORDS THAT AMAZON REQUIRES at the bottom of the page. Sponsored posts have no-follow links (encouraged by Google to help your page rank) and an FCC-required disclosure about sponsored posts at the beginning of such posts. NOTE: I am still NOT YOUR LAWYER, so check with legal counsel for advice. This blog and its contents are not and should not be construed as legal advice. There are some pages that you should create and link to, including an About Me page, a note about advertising for your readers, a note about advertising for potential sponsors, and any legal disclaimers required by your advertisers. Feel free to check out my pages (the very last thing at the bottom of my page) to see what I mean. NOTE: As I've said, I am NOT YOUR LAWYER, so check with legal counsel for advice. This blog and its contents are not and should not be construed as legal advice. Now, bookmark this page, get out your planner, and make notes on how to update your blog to make it less cookie cutter and more fabulous! Hmm, good ideas. I did some of those same things last night. I need a blog critique! Until you mentioned it last week I didn't know it was possible to remove the Blogger attribution. I googled for instructions and have successfully done that - thank you. Perhaps "that woman" thought your blog was about gifts and presents, since it's the holiday season and all. I don't have a free template but I have been meaning to add a tagline to my blog. (Un)fortunately I had my blog designed by someone and will have to have them add it the next time I get a redesign but I cannot afford it at the moment so it'll just have to wait! Found you on Way back Wednesday! Great tips, Kristy. Will need to add these to my blog to-do list for some point. As for me, I don't put that much thought into the aesthetics of someone's blog. If the content is interesting and easy to read, then it really doesn't matter to me if their header is dark, or their tagline isn't kitchy. I don't read to critique their blog, I read because what they have to say intrigues me. I must admit that I had first come across you on Twitter when a planner person I was following was retweeting your posts. I never considered them because I thought maybe you were a gift shop that sold planner supplies. Until one day I saw an intriguing title of one of the re-tweets, clicked it on and discovered all the planner and time management goodness of your blog. I spent several hours over the course of 3 days perusing your posts all the way back to 2007. Yes, it's important to have a clear, concise navigable front page, but - IMO - it's the content that keeps me hooked and coming back. Great information! I want to participate (or host) in a blog review but I'm like that person who needs to clean her house before the housekeeper comes. I know my pages need some updating, but finding time is always a challenge. Thanks for sharing the info about Amazon wording. While I always disclose, I wasn't aware there was specific wording required. I will find time to fix that! Thanks for sharing this great post at the Blogger's Pit Stop! Love this post! I also participated in a blogger review awhile back and found it extremely helpful. However, I think that the person that used the word "juvenile" (your blog is anything but) was very unprofessional and shouldn't have been critiquing people. There's a big difference between constructive criticism and just being mean but it doesn't sound like she knew the difference..
Great tips! I can only imagine how frightening that kind of criticism could be. I know it's important to believe in what you do, as well as, do what you enjoy. I'll be keeping your advice in mind! I've come to realise we can't please everyone all of the time. I've asked for feedback on my website and mostly it was positive but when it comes to images everyone has a different idea! I think it is a great idea to ask for feedback as long as we don't get too stressed trying to do what everyone suggests. A great informative post and I'm glad you linked it to #OvertheMoon. Have a great Christmas and happy blogging! I'm on Wordpress, not Blogger, but these tips were very helpful. I'm very new to blogging and love this kind of advice! I'll have to check out how to participate in a review. You were the most clicked link at the Faith Filled Parenting LinkUp Party!! Congrats and thank you for sharing. Come back and join us again. Wow, this is a great article, lots to check out and think about--thanks! Thanks for sharing at Funtastic Friday!